Using fruit in a floral display is a very inexpensive way of creating maximum impact. It adds texture colour and freshness to any variety of design and you can let your imagination run riot. It is so easy to be creative with something which is so natural. Vibrant fruits such as lemons or limes are wonderful for summer weddings or displays, while rosy apples, pomegranates and oranges are perfect for those long winter days.From urban weddings and themes to the more traditional displays, fruit is very versatile. Just make sure, before you use it, that it is clean and free from any creepy crawlies! One tip is to rub glycerine (available from the floral wholesalers) into the skins to make them shine. This is actually a very simple display to make but it makes an instant stunning impact. The vibrancy of the limes against the white of the roses is stark and just oozes chic and elegance. Add a long tall glass vase and it will be the first thing that people notice when they walk into a room. Remember this is a very modern display so you need to think about where you use it very carefully. It wouldn’t suit every venue and is much more appropriate for a contemporary setting. Start filling up the glass vase with limes. After approximately six limes add some lime green sisal; Place more limes on top of the sisal and about eight inches from the top of the vase add more sisal again right to the top. Add a ring of flora bond to the inside top of the vase. Place the foam ball on top of this and push in securely. For added security insert two wires into the ball cross ways and then tape the exposed ends onto the vase. 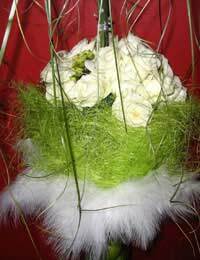 The exposed space between the roses and the feathers is covered with lime green sisal and secured into place with pearl headed pins. This is a fairly large display and because it takes a short time to create should ideally be done “in-situ.” but it can be transported easily by removing the decorated foam ball and placing it in a box surrounded by bubble wrap. The vase should also be wrapped in bubble wrap and the materials added when it is in place.